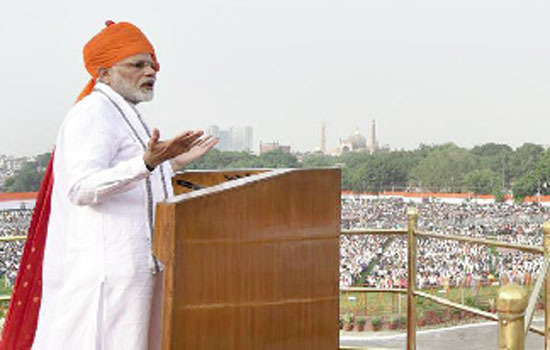 New Delhi: The Prime Minister, Shri Narendra Modi, addressed the nation from the ramparts of the Red Fort, on the occasion of the 72nd Independence Day. Asserting that India is today brimming with self-confidence, the Prime Minister mentioned developments such as the success of Navika Sagar Parikrama by six young women naval officers, and the achievements of young Indian sportspersons from humble backgrounds. The Prime Minister paid homage to the freedom fighters and martyrs. He saluted the jawans of the security forces and police forces. He recalled in particular, the martyrs of the JallianwalaBagh massacre, which happened on Baisakhi day in 1919. He offered condolences to people affected by floods in some parts of the country. He quoted poet Subramaniam Bharti to say that India will show the world the path to freedom from all kinds of shackles. He said such dreams were shared by countless freedom fighters. And an inclusive Constitution was drafted by Babasaheb Ambedkar to achieve this dream of a nation where there is justice for the poor, and equal opportunities for all to move forward. He said that Indians are now coming together to build the nation. He gave examples of the pace of development in various fields such as toilet construction, electricity reaching villages, LPG gas connections, house construction etc. He said India is now a member of several important multilateral organizations, and is leading the International Solar Alliance. Reiterating the vision to double farmers’ incomes by 2022, the Prime Minister asserted that the aim is to accomplish tasks which seem extremely difficult. He said initiatives such as UjjwalaYojana and Saubhagya Yojana are providing dignity to the people. He said organizations such as the WHO have appreciated the progress made in the Swachh Bharat Mission. Shri Narendra Modi announced the launch of the Pradhan Mantri Jan Arogya Abhiyaan on 25th September this year – the anniversary of Pandit Deendayal Upadhyay. It is high time we ensure that the poor of India get access to good quality and affordable healthcare, he asserted. He said this scheme would positively impact 50 crore people. The Prime Minister explained how better targeting of government benefits has been achieved by weeding out about 6 crore fake beneficiaries. The honest taxpayer of India has a major role in the progress of the nation, he said, adding that it is due to them that so many people are fed, and the lives of the poor are transformed. The Prime Minister asserted that the corrupt, and those who have black money would not be forgiven.